Creed Taylor (1820-1906) – Born to Josiah and Hepzibeth Luker Taylor in Alabama on April 20, 1820, Creed was one of nine children. 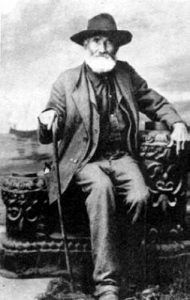 When he was just four years old, he moved with his family to DeWitt County, Texas in 1824. At the age of just 15, Creed began to fight in the Texas Revolution against Mexico, participating in the Battle of Concepción, led by James Bowie and James Fannin on October 28, 1835. The following month, he fought in the Grass Fight just south of San Antonio de Bexar on November 26, 1835 and in the Siege of Bexar in December. The next month he was with the Texas forces at San Patricio where he was detached duty as a scout, a position he held until March. After the fall of the Alamo in March, 1826, Taylor was sent to join the forces at Buffalo Bayou and on April 21st, fought in the Battle of San Jacinto. Taylor married Nancy Matilda Goodbread on April 25, 1840, and they would eventually have two sons and a daughter. Taylor continued his soldiering responsibilities until he joined the Texas Rangers in 1841 and fought Apache with John Coffee Hays in the Battle of Bandera Pass. The following year, he was again fighting the Mexicans in the Battle of Salado Creek where he was wounded. After his recovery, he enlisted as a private in the Texas Mounted Rangers and fought in the Mexican-American War, participating in a number of battles. In February, 1854, he enlisted in the Confederate Army. In 1867, his wife Nancy died and the following year, his sons, John and Phillip both got involved in the Sutton-Taylor Feud, the longest and bloodiest of all the feuds in Texas. Both men would be killed in the feud. Creed later moved to Kimball County, Texas and married Lurvenia Spencer in February, 1873. The couple would eventually have five children. In his later years he dictated his recollections to James T. DeShields, but they wouldn’t be published until 1935 in Tall Men with Long Rifles. Taylor died on December 26, 1906, and was buried in the Noxville Cemetery in Kimball County.